This tuesday afternoon died in Mexico City WBA & WBC former bantamweight world champion Jesus ¨Chucho¨ Castillo victim of a heart attack from complications of peritonitis. 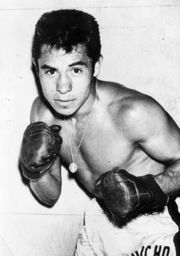 Castillo had a record of 47-18-2 22 KOs and achievement fights against the best at the time as: Jose Medel, Bernardo Caraballo, Jesus Pimentel, Lionel Rose, Rafael Herrera, Ruben Olivares, Enrique Pinder, Bobby Chacon Rafael Ortega and Danny Lopez among others. On October 16, 1970 at the Forum in Inglewood, California snatched bantamweight crowns the WBA and WBC to the legend Ruben Olivares by TKO in 14 rounds. Currently working on the Metro Workers Union of Mexico City and was known as a kind and decent and a good counselor.